Synopsis: Golden boy Ezra Faulkner believes everyone has a tragedy waiting for them—a single encounter after which everything that really matters will happen. His particular tragedy waited until he was primed to lose it all: in one spectacular night, a reckless driver shatters Ezra’s knee, his athletic career, and his social life. I kinda put this review off a lot for some reason :/ So it'll be short and to the point. 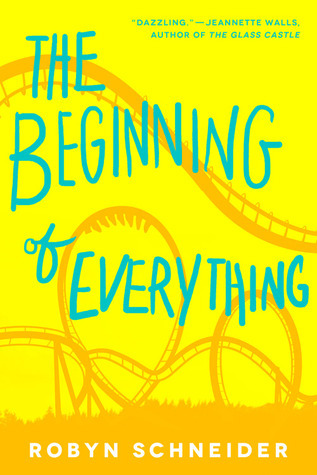 The book teaches that there's always some moment that becomes a beginning for everything. There were laugh-out-loud moments, moments where I just sat stunned in silence, and some that had me facepalming. The characters were well written and believable, which I like the best. Cassidy was easily my favourite from the beginning, and although I understand why she decided and made the conclusion of the book to be like that, I can't help but wish that I just wanted a happy ending for her. Being the hilarious quirky debate queen, she captures our dear Ezra's heart. Now Ezra. Our protagonist. I did like him, although he was a bit strange at points. His beginning was obviously the car crash, but what I don't get is why he thought just because he was no longer to use his knee anymore to play tennis, he convinced himself that no one wanted him anymore. The all star popular boy, typical "golden boy" as the synopsis puts it. He avoided all his old friends and sat somewhere else during lunch, got really surprised when his friends started talking to him after school started. (Albeit that was a good thing because his friends were jerks.) That part didn't get explained very well and left me confused. Or maybe it was just because I have never been in his "popular" situation where people apparently get cut out fast as soon as they do something wrong. *shrugs* Oh also I wish the secondary characters were gone in more detail. None of them were too memorable for me. The story mostly focused on our mains. The plot, although it didn't stand too much, grew on me. The ending doused me with cold water and told me again, that books don't always end in the fairytale way we want it to. I became to love the characters, their morse code exchanges, the tumbleweed snowman, and everything. Sure there were flaws, and the way the book closed -.- , but overall it was a really good. I would recommend it :D If you have time for a quick contemporary read you should really pick it up and give it a try. Happy readings!